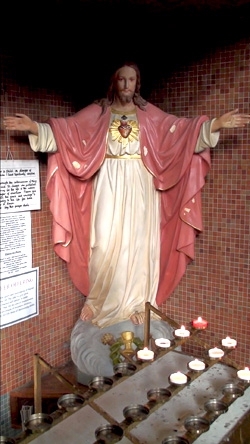 The Sacred Heart of Jesus is one of the most famous religious devotions to Jesus's physical heart as the representation of His divine love for Humanity. It stresses the central Christian concept of loving and adoring Jesus. The origin of this devotion in its modern form is derived from a French Roman Catholic nun, Marguerite Marie Alacoque, who said she learned the devotion from Jesus in visions. Predecessors to the modern devotion arose unmistakeably in the Middle Ages in various facets of Christian mysticism. 0 Sacred Heart of Jesus, I fly to Thee for rest. Unshaken as I cry, dear Lord, I place my trust in Thee. O sweet Saviour, may Thy face smile on my soul all free. Oh may I cry with rapturous love, I've placed my trust in Thee.